Sorry, I couldn’t think of a witty, creative title today. I’ve been wanting to write about Chakras ever since I returned from Italy. Or at least I think I have because I have been sharing my experience with Chakra training nearly every day since I’ve been back. I am also 90% sure that 90% of the people I tell, still have no idea what a Chakra is and how it may benefit them to learn more about it. So… what better way, then here, on a blog whose topics claim (every once in a while :)) to be about yoga. Now is my chance to let people know why Chakras are just as cool as a music festival started by Perry Farrell (at least it was cool in the 90’s… is it still even relevant)? Well, the point is, Chakras are pretty rad once you figure them out. As you know, I went on a trip to Italy earlier this month. The main purpose of my trip was to attend a yoga retreat in Tuscany. While I was there, I also had the opportunity to take another teacher training module: Chakra Training, from the very lovely Wendy J. My intention was to learn how to incorporate Chakras into my yoga classes (should I ever teach a class :P). What I actually learned, to my surprise, ended up being very eye-opening and life-changing. Even if you aren’t into yoga, Chakras are fascinating. They are a great way to recognize yourself and your personal struggles and strengths. I like to think of Chakras as clarity of self. A roadmap to your clarity of self. In this post I will provide an overview of Chakras- what they are, how they work. Then, I will go through them one by one, dedicating a post per Chakra. I am also going to attempt to explain this in the most basic way as possible, assuming that a good chunk of you aren’t doing yoga and don’t know anything about Chakras in general. So, what the F is a chakra? 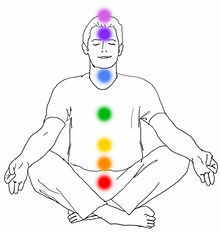 (From Wikipedia) Chakras are the centers of Prāṇa, life force) or vital energy. Chakras correspond to vital points in the physical body i.e. major plexuses of arteries, veins and nerves. Their name derives from the Sanskrit word for “wheel” or “turning“. The chakras are thought to vitalize the physical body and to be associated with interactions of a physical, emotional and mental nature. They are considered loci of life energy or prana, which is thought to flow among them along pathways called nadis. The function of the Chakras is to spin and draw in this energy to keep the spiritual, mental, emotional and physical health of the body in balance. Ok, but what are they exactly… how many are there? There are symbols associated with each Chakra that I will include as I break them down in future posts. I will visit each one, and show you how a blocked or a free chakra may be impacting your life and/or health. I will write about my own personal examples of this, and perhaps you can see how it may apply to your own life. When I write about specific Chakras, you’ll understand at least why I care. Looking at Chakras is like having therapy… you are taking a really good look at yourself and understanding who you are and where you are stumbling… and where you are succeeding. It will also help identify to root or potentially emotional cause to some typical ailments and health issues. I like Chakras because in learning about them, it was the first time I had an answer to things that I could never pinpoint about myself… I had clarity. Clarity of self. When you have clarity, you know what you need to do, you know how you want to go about it all… whether in feeding that success, or taking on that stumbling point. That is why I am so interested in the Chakras, I see areas within myself that I didn’t realize were blocked and were keeping me from having and experiencing so much more. Ok, No Really, Why Care? This sounds like New Agey Shiz. If you want to dismiss this as such… I’m not going to stop you. But this organization and explanation of self… it rang true for me. I identified things in myself that friends, family, therapy and my own mind couldn’t grasp until I saw it all laid out nicely in this format. For the logical-minded out there… it is simply a way to define yourself, in a clean, orderly way. If you have been to a therapist or know yourself pretty well, then a lot of things will be repetitive, they’ll just have a nice, tidy definition to it. Next post I’ll dive right into the first Chakra: Root Chakra (Muladhara). I’ll be curious to know what you think- and if any of this resonates at all. “All of the problems that you face in life, all the ups and downs are really the means to your personal evolution. Everything that you face in life, whether pleasant or unpleasant, is really the means to higher awareness. They really help you. Though they may seem to hinder you from a limited and personal viewpoint at this stage, they are really the tests, the means to your personal transcendence and total understanding of reality. Though mental disturbances in every day life may seem like obstacles, they are really the things that help you to become aware of, to confront and remove the personal blocks or hindrances that prevent the flight into your higher awareness. Without apparent obstacles you would never become aware of imperfections in yourself that prevent a higher experience. It is only through your enemies that you can recognize personal hang-ups. It is only through unhappiness that you can recognize the seeds of disharmony within yourself. Without day-to-day problems, you would never try to overcome obstacles.